From December 22, 2017 to February, 2018, come experience the world’s largest ice festival in beautiful Harbin city. Mardi Gras in New Orleans – Mardi Gras 2018 is on Tuesday, February 13, 2018. The date of Holi is different every year in India! In most of India, Holi is celebrated at the end of winter, on the day after the full moon in March each year. On the eve of Holi, large bonfires are lit to mark occasion and to burn evil spirits. This is known as Holika Dahan. In 2018, Holi is on March 1st and ends March 02nd. Holi, also known as the Festival of Colors, celebrates the end of winter and the beginning of spring. It’s fun, safe, and free. Just remember to BYOD (bring your own dye). Glastonbury. This five-day bonanza offers dozens of live stages, attracting almost 200,000 people every year. The event hosts the absolute best of the musical world – names like Radiohead, The Smiths, Kanye West and Beyoncé have previously played here. The event also supports upcoming acts and promotes dance, comedy, theatre, cabaret and arts. ( *no dates for 2018 – field has to fallow). Bonnaroo Music and Arts Festival, Manchester, Tennessee June 7th- 10th, 2018. 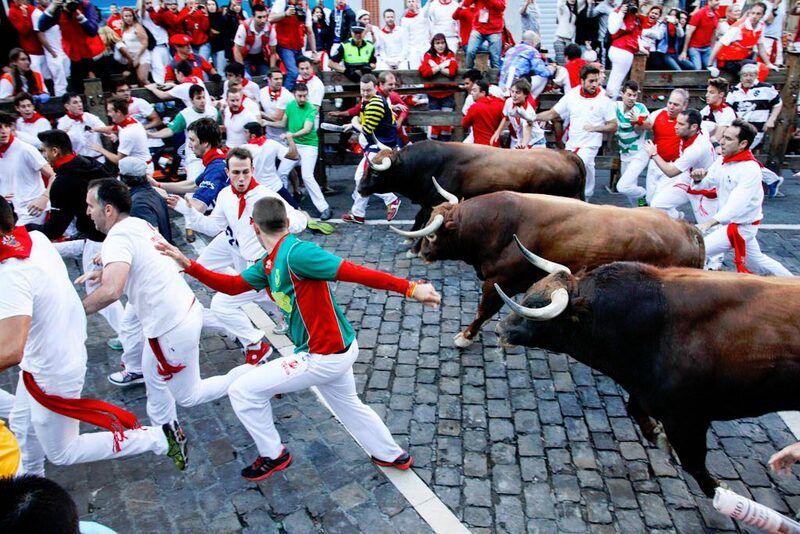 The Running of the Bulls is a part of the San Fermin Festival, which runs in Pamplona from July 6 to July 14 in 2018 and every year. Burning Man 2018 taking place August 26– September 3, 2018 in the Black Rock Desert of Nevada. Their mission: The Burning Man organization will bring experiences to people in grand, awe-inspiring and joyful ways that lift the human spirit, address social problems and inspire a sense of culture, community and personal engagement. This is by no means your average festival! On Saturday, September 22nd, 2018 the Schottenhamel tent is the place to be, if you want to catch the official opening ceremonies. At noon, the Mayor of Munich will have the honor of tapping the first keg of Oktoberfest beer. Runs until October 7th. International Balloon Festival – Albuquerque, NM -Saturday, October 6th – 14th, 2018 The Albuquerque International Balloon Fiesta is an annual October festival that takes place in New Mexico. It was first launched in 1972 with just 13 participants. Today, more than 500 balloons take to the skies over Albuquerque each year, making the Balloon Fiesta the largest event of its kind worldwide. Day of the Dead, Mexico is celebrated from October 31 till November 02, 2018. My fellow swamper and I decided to take in the annual Caribana festival some years ago and were up at some ungodly hour to take the Go train into the Exhibition grounds and make sure we had a good seat for the proceedings. I’m pretty sure we were the first ones there and we set our chairs up at a certain point along the parade route that we thought would give us the best advantage for taking photos. As the morning progressed and things started getting busier, more and more campers were coming in and setting up tents and hauling in coolers and grills and we got to see what serious onlookers did to set up. Obviously this was a long all day event for them. I’m not sure we even thought ahead enough to bring water with us. We met some really nice people from Antigua who come out for it every year and one of their daughters was taking part, we got to meet her later, lovely young lady. Well after noon, the parade finally started and the colours and the hoopla were meant for photography. Everyone seemed to be having a great time and the music was vibrant and made you want to get up and dance to it and the costumes were more beautiful with each passing group. The stars of the show though were the extravagant floats, some of which were worn by a shapely individual and hauled on wheels behind them to trailer floats with everyone dancing and playing instruments. It was a sea of colour and feathers and sensual brown bodies in complicated and colourful two pieces with towering headpieces of bejewelled adornment. The Grande Parade will take place on Saturday, August 5th in 2017 but officially Caribana starts on August 3rd and runs until August 7th. Try and book a week-end at one of the hotels downtown as the later it gets on the day of the parade the more congested the traffic.